It’s another fun Thursday once again! It’s Nostalgia time! Thanks to sis Rose for creating this nostalgic meme. Anyhow, here’s my entry for this week. 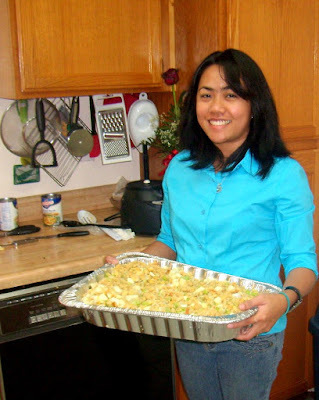 It was year 2008 when hubby and I first hosted a Thanksgiving dinner at our house in California. It's an overwhelming experience specially when you do all the preparation. But I'm glad my sister- in-laws was there to help me cooked. We had a feast-full and sumptuous Thanksgiving dinner with the Dias clan. Thanksgiving is quite a big production...sa turkey pa lang, parang nakaka overwhelm na. :p it's a good thing you have family members who helped. Happy Thanksgiving Dhemz, to you and your whole family. Have you transferred already in your new home and will celebrate Thanksgiving there? Yes, that's a nostalgic Thanksgiving celebration you hosted in your former house in California for the whole Dias clan way back in 2008. Thanks for the nostalgic post. God bless you all always. wow, tradition kasi jud na sa mga Americano.. although sa pinas pwede ka naman magthanksgiving kung kanus-a naa ocassion.. agi ko dhemz. Wow, that's a lot dhemz! agoy wala ko kakita ani nga entry.... lol what an excuse! Busy gyud kaayo pag kita ang mag host. Glad you had your sister in laws to help you. The foods look yummy.